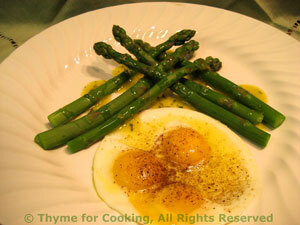 Asparagus with Quail Eggs, Thyme for Cooking vegetable starters. Snap off ends of asparagus. If your asparagus is very thick or if it’s white, use vegetable peeler and peel the bottom half of stalk. Lower heat and cook just until done, 6 - 10 minutes, longer for white, adding a bit of water as needed. Heat oil or butter in skillet over medium heat. Add eggs and fry until the whites are set. They are meant to be 'sunny-side up' - which is: whites set, yolks runny..... or cook them however you like them. Drizzle a bit of vinaigrette on half of a plate. Lay asparagus out nicely on top. Put three quail eggs (or 1 chicken egg) on the other half of the plate. Salt & pepper eggs if you like and serve, any remaining vinaigrette on the side. Slowly drizzle in oil, whisking constantly. Tip: If using quail eggs crack them and put them into 2 small bowls, 3 eggs each, to make frying them easier. They'll be ready to slide into the hot pan. The shells are a bit tougher then chicken eggs so it requires a bit more effort.